A young woman with dissociative identity disorder suspects that one of her personalities might be a superhuman killer. Detective Moss’ interview with Suki, a girl suffering from dissociative identity disorder, is interrupted by criminal psychologist Jennifer Silk. Silk questions Suki about a string of jumper deaths believed to be murders at Juniper Tower, a halfway house for the mentally ill nicknamed “Jumper Tower” because of its pattern of suicides. In flashbacks, Suki arrives at Juniper Tower for the first time and meets fellow troubled residents Emily, Cleo, and Bunny. Suki is already familiar with Hogan, her friend and neighbor across the hall, from their previous stint together under the care of Dr. Sinclair. As the lone male in the building, Hogan is known for having affairs with the various female residents. To treat Suki’s multiple personalities, doctors Karim and Satomi aid Sinclair in his controversial use of “Siamese Burn” therapy, a technique designed to eradicate or assimilate alter egos. A condition of Suki’s release is that she regularly use a portable Siamese Burn module at home to continue her treatment. Each use destroys one personality while seemingly strengthening that of “The Scribbler.” The Scribbler is a mute personality of Suki’s that communicates only by writing backwards. A bulldog appears in Suki’s apartment and speaks to her in a Cockney accent. Suki later learns from a resident named Alice that the dog is also named Hogan after Alice repeatedly pushes Suki down the stairs. Each time Suki uses the module, she blacks out. The Scribbler then takes over and another Juniper Tower resident dies. Suki wonders if her Scribbler self may be responsible. Hogan uses the machine on himself and discovers that it actually unlocks a person’s true identity and full potential. He explains that the Scribbler is Suki’s real personality fighting to break free. It is eventually revealed that Alice is the true murderer behind the Juniper Tower jumping deaths. Infatuated with Hogan, but upset over his infidelity, Alice used the module to unlock her homicidal true self. She and Suki both power up using the machine and battle one another. When Suki forces Alice to realize that she harbors a killer inside of her, Alice willfully jumps off the tower and dies. Silk and Moss have difficulty accepting Suki’s version of events. Hogan creates a distraction in the building by using the module on himself once more and Suki, now consumed by the superhuman Scribbler, uses the opportunity to escape. Halfway house Juniper Tower, Los Angeles’ Linda Vista Hospital standing in for yet another filmic funny farm of dubious distinction, has earned itself the nickname “Jumper Tower” thanks to countless residents freefalling from its upper floor suicide suites. Suffering from multiple personality disorder, troubled young Suki is the latest addition to the building’s roster of kooky mental patients on the mend. Suki’s mind is crowded by a number of shouting voices, though the alter ego causing the most consternation is the one who remains conspicuously silent. Suki’s “scribbler” personality communicates through backwards writing, which would be harmless if she were not in the habit of taking possession of Suki right before another building denizen does a concrete face plant. With a detective and a criminal psychologist looking for answers regarding the rash of deaths at Juniper Tower, “The Scribbler” plays out in a series of Verbal Kint interrogation flashbacks. A finger of fault pointed at her face, Suki recalls the past, racks her brain, and tries connecting the dots between the jumpers, the scribbler, and the mystery of the Siamese Burn module, a device meant to unlock Suki’s true identity that may actually be powering a superhuman killer inside. Even with a punk chic attitude and dour demeanor, Katie Cassidy’s Suki manages to be cheekily charming in spite of frequent frowns and oppressive depression. It may not be a total breakout role, but fans of Cassidy’s previous work will lap up her against-type star turn here while new converts are likely to board her bandwagon. As appealing as she is, Garret Dillahunt nearly takes command as her deliriously frazzled BFF with occasional benefits. Dillahunt bears the burden of furthering the storyline with occasionally basic dialogue, but his mannerisms give the lines a warm wittiness that creates a complete character even while delivering exposition or acting as Suki’s sounding board. If there’s a complaint to be had about the remaining cast, it’s that their presences are underutilized, as though “The Scribbler” needs to sit a spell with the Siamese Burn module to shake loose its own unrestricted personality. Draped in a python and striding slowly heel to toe, Gina Gershon channels a bemusing cross between Cleopatra and Elvira in a role somewhere between cameo and featured extra. Sasha Grey’s appearance totals around 30 seconds, and that includes time spent looking at her picture on a piece of police paper. Kunal Nayyar of “The Big Bang Theory” is so far in the background during his VHS tape-recorded segments as to be unnoticeable. No fan of “The Sopranos” or “Buffy” would ever complain that Michael Imperioli and Eliza Dushku are unnecessary additions, though their characters are quite possibly the least critical to the plot. Another supporting player takes on a larger role at a moment when she is all but forgotten, presumed to be another disposable tower resident of minor significance. One could argue it makes her true identity reveal more of a shocker, if not for the fact that neglecting her existence in the first place takes meaning out of the mystery. Influenced by both the dark and the color of 21st century superhero epics, “The Scribbler” takes place in a grim graphic novel world, unsurprising since it is based on screenwriter Dan Schaffer’s sequential art story of the same name. Colored lights, heavy rainfall, high contrast shadows, and plenty of slow zooms to emphasize drama or revelatory clues emulate a Zack Snyder style using one-tenth of the budget. It’s a look fitting for the mood of bubblegum-pop noir. It’s almost appropriate for a movie about identity struggles to have more than one of its own. Like the seesaw of underwritten roles thankfully balanced by a great stable of fan favorite talent, the visual sheen is occasionally battered by strange cinematic choices like the use of “found footage” hospital recording flashbacks. Who was authorized to record official patient sessions with the camera mounted on a Slinky and a zoom lens with Tourette syndrome? 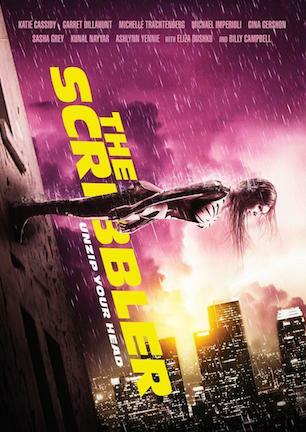 Like Suki, “The Scribbler” is in need of some external stimulus to unzip its full potential. A crackling concept and simmering style bubble beneath a presentation having difficulty turning its knob to a full boil. And comfort in the company of wrist-cutters and goth girls with heavy eyeliner is required to wade past the duller dips. Still, enough of the movie’s personality shines through to root it in a realm of leveled creative energy and measured sci-fi thrills. “The Scribbler” may be inconsistently entertaining, but it is consistently engaging. September 21, 2014 by Ian Sedensky.